This table (Rothermel, 1983) suggests the fuel moisture associated with the phenology or stages of plant development through a year that includes dormancy. 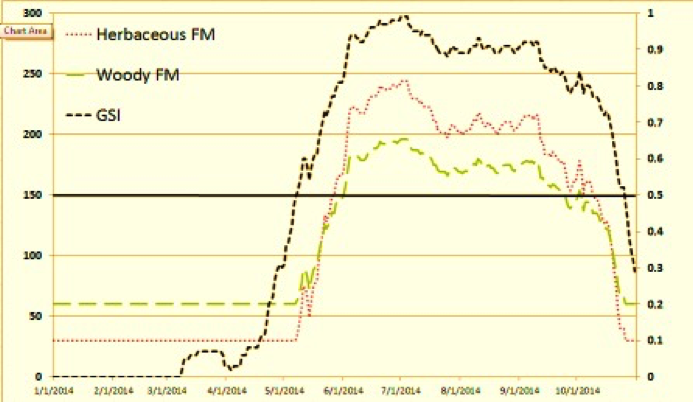 During dormancy, all three models estimate herbaceous fuel moisture as if they were dead fine fuels. Minimum woody fuel moisture estimates vary, when dormant, according to the established Climate Class for the weather observing location. 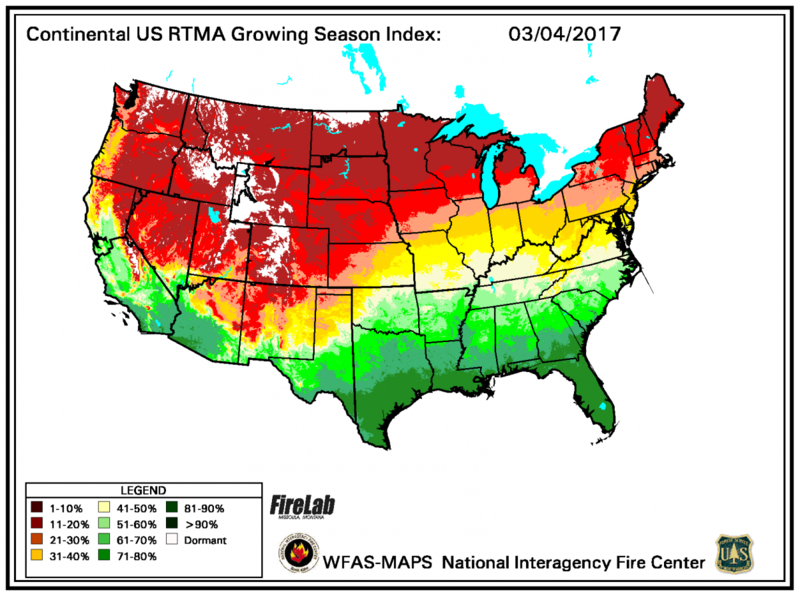 Green-up/Green occurs in spring and early summer, when live fuel moistures trend from dormant minimums up to 250% under most favorable conditions. Transition describes the process of progressive curing due to dry weather and soil conditions prior to frost and freezing conditions. Freeze/Frozen conditions lead to rapid curing of live fuels into a dormant state at the end of the season if they haven’t already been fully cured in transition. 1978 NFDRS expects the user to identify a green-up date, after which live fuel moistures increase to maximum levels over a fixed number of days established by the climate class designation. After that, live fuel moistures transition trends follow 1000-hr (and x1000h) trends until fully cured or freeze/frozen conditions are selected. 1988 NFDRS replaced the green-up and transition trends with user selected designations of Season and greenness level for herbaceous and woody fuels. 2016 NFDRS uses a weather based index of plant development, called the Growing Season Index (GSI), to automate the process. It identifies when green-up begins, how fast it progresses, the maximum live fuel moisture, transition curing, and when freeze/frozen dormant conditions occur. 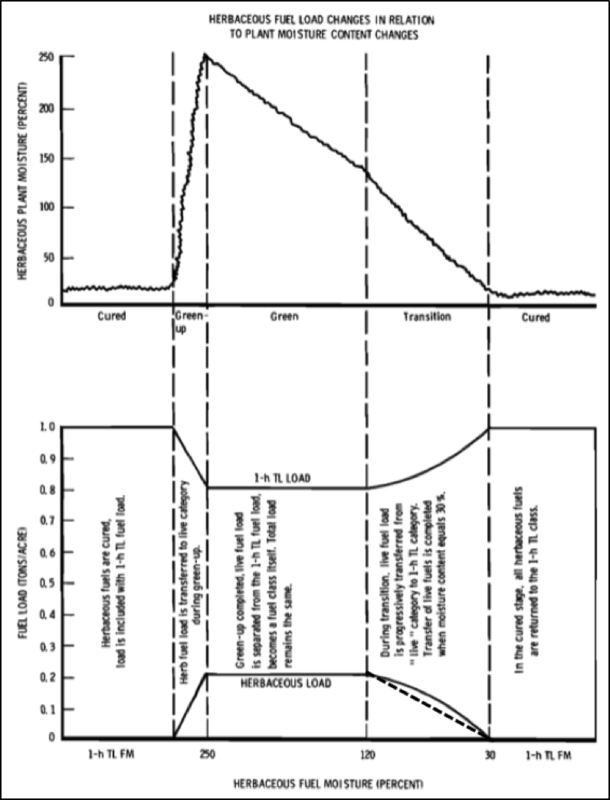 The Growing Season Index (Jolly, et al, 2005) is a simple metric of plant physiological limits to photosynthesis. It is highly correlated to the seasonal changes in both the amount and activity of plant canopies. It predicts the green-up and senescence of live fuels and the influence of water stress events on vegetation. GSI is calculated as a function of the three indicators of important weather factors that regulate plant functions. These indicators are combined into a single indicator that integrates the limiting effects of temperature, water and light deficiencies. More information at https://www.wfas.net. Minimum temperature: Many of the biochemical processes of plants are sensitive to low temperatures. Although ambient air temperatures certainly influence growth, constraints on phenology appear to be more closely related to restrictions on water uptake by roots when soil temperatures are suboptimal and many field studies show variable ecosystem responses over a range of minimum temperatures. Vapor Pressure Deficit (VPD): Water stress causes partial to complete stomatal closure, reduces leaf development rate, induces the shedding of leaves, and slows or halts cell division. Although models are available to calculate a soil water balance, they require knowledge of rooting depth, soil texture, latent heat losses, and precipitation. As a surrogate, we selected an index of the evaporative demand, the vapor pressure deficit (VPD) of the atmosphere. 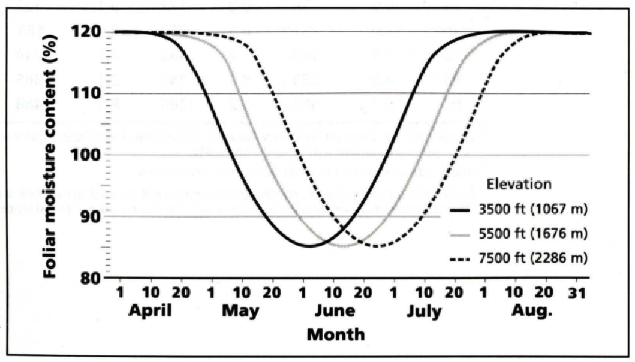 Photoperiod or Daylength: Photoperiod provides a plant with a reliable annual climatic cue because it does not vary from year to year at a given location. We assume that photoperiod provides the outer envelope within which other climatic controls may dictate foliar development. Studies have shown that photoperiod is important to both leaf flush and leaf senescence throughout the world. Example of 2014 seasonal values of the GSI and Live Fuel Moistures, Watford, North Dakota. Upper and lower limits of the indicator functions used to calculate the Growing Season Index. Example values of the GSI, their interpretation and effect on NFDRS Live Fuel Moistures. 0 to 0.5 Pre green-up; dormancy. Herbaceous fuels at 30%, woody shrubs at dormant values at 50-80%. >0.50 Green-up; Live fuel moisture increases linearly with GSI from dormant values. Below 0.5 Cured herbaceous and shrub dormancy. Herbaceous fuels at 30%, woody shrubs at dormant values. The data and processing of the GSI, and the dependent live fuel moistures,make gridded map depictions possible and automated processing a reality. 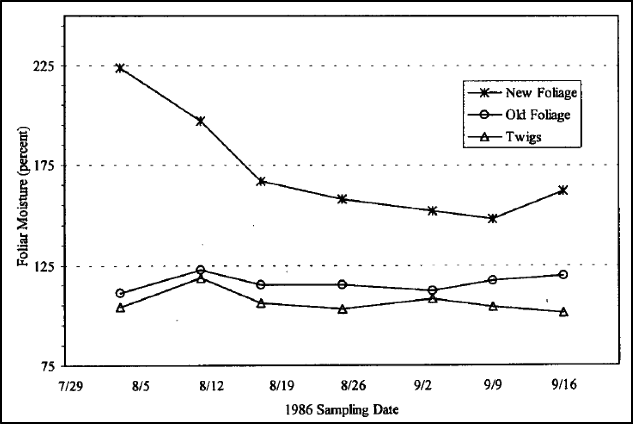 As shown in this graph (Burgan, 1979), herbaceous fuel moisture influences both the flammability of living herbaceous vegetation and the transfer of living herbaceous fuel loads from and to dead fine fuels. The dashed line with the herbaceous load trend shows the trend for dynamic fire behavior fuel models. Herbaceous fuel moistures vary between 30% at dormancy and 250% at peak green-up. Herbaceous loads are transferred to and from dead fine fuel loads based on fuel moisture. At 30%, all load is dead. At 120% all load is live. In 2016 NFDRS, herbaceous FM is at 30% when GSI is 0.5 or less and at 250% when GSI is at 1.0. HFM trends match GSI between 0.5 and 1.0. Dormant defaults range from 50% in climate class 1 - 80% in climate class 4. Peak green conditions are represented by fuel moisture of 200%. In 2016 NFDRS, min WFM is set at GSI of 0.5 or less, at 200% at GSI of 1.0 and trends with GSI between those levels. There is no fuel load transfer between live and dead fuels based on woody fuel moisture. 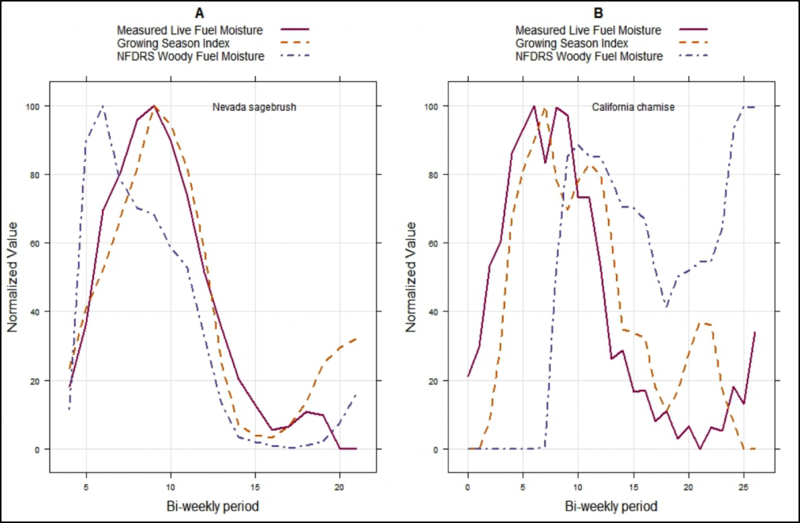 This graphic shows the agreement between the Growing Season Index (GSI) trend and measured woody fuel moisture for Nevada sagebrush and California chamise, two very important fire landscapes. Note: difference from the 1978 NFDRS woody fuel moisture trend was based on the 1000hr fuel moisture trend. Foliar Moisture Content is defined (in the BehavePlus Variable) help as the moisture content of the conifer needles in tree crowns. It is used along with surface fire intensity and crown base height as input to the crown fire initiation model. Further, it is generally measured using only mature conifer needles at least one-year old. In some cases, evergreen hardwoods and deciduous species with resinous leaves will carry crown fire. Estimates of foliar moisture should reflect flammability of these crown fuels. BehavePlus allows a range of 30-300% as with other live fuels, but WFDSS allows only a range of 70-130%. Default value is typically 100%. The example plot below, for Abies Lasiocarpa or Subalpine Fir, compares moisture content for new and old foliage (Agee, et al 2002). As shown in this graph, there is a measurable Spring-Dip in measured foliar moisture content of mature needles associated with the emergence of new growth, at least among northern conifer (Hirsch, 1996 and Jolly ,et.al., 2014).